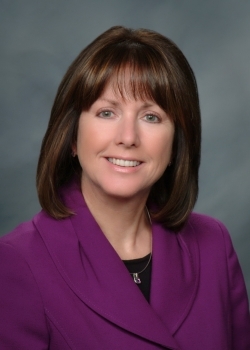 2015 is off to a great start for International Economic Development Council (IEDC) and I am excited and honored to spend the next 12 months as the Chair of our Board of Directors. In this capacity, I will be traveling the globe and conferring with my fellow economic developers on many of the pressing issues and opportunities our profession is facing. One event I am particularly looking forward to attending is the 2nd SelectUSA Investment Summit. Having attended the first Investment Summit in 2013, I can personally attest to the value of coming to Washington to meet with colleagues from across the U.S., hundreds of international investors – I’m told this year’s summit will feature twice as many investors – and hear from a robust speaking program featuring top administration leaders in foreign direct investment attraction. Foreign direct investment has proven to be a vital tool in the economic developer’s toolbox in the years following the Great Recession. In my own community, Saginaw, Michigan, it has contributed to the creation or retention of thousands of jobs over the past five years. One company, Nexteer, has invested hundreds of millions of dollars in expanding their operations in Saginaw, which has resulted in thousands of jobs being created or retained. As an economic developer, I cannot overstate the importance of the resources that SelectUSA has provided my organization and countless others within my profession. Simply put: SelectUSA brings clarity, focus and action to the role of the federal government in supporting FDI attraction at the local, regional and state level. They are an essential partner in the work of economic developers to create jobs and improve the quality of life in our communities. They are also a valued partner of IEDC in Washington and have played a key role in raising the profile of our profession over the past few years. 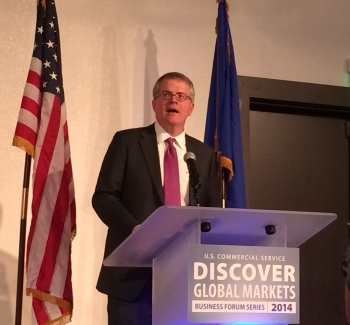 Earlier this week, Deputy Commerce Secretary Bruce Andrews traveled to Minneapolis and provided the keynote address on the Administration’s trade agenda and global opportunities for U.S. businesses in the healthcare and life sciences sectors at the Discover Global Markets Healthcare and Life Sciences Conference. The event was part of the Discover Global Markets series, which is sponsored by the International Trade Administration’s U.S. Commercial Service. During his remarks, Deputy Secretary Andrews discussed his recent trip to China for the Asia-Pacific Economic Cooperation Summit, stressing the fact that with the world’s largest population, continued prospects for robust growth, and an aging middle class population demanding more health care, China is clearly a market worth a lot of attention from U.S. companies. U.S. businesses generally are well-positioned to provide innovative health care solutions. Deputy Secretary Andrews pointed out success by U.S. companies in healthcare during Commerce Secretary Penny Pritzker’s recent healthcare and energy business development mission to Japan and South Korea. He also announced that the Commerce Department is planning three upcoming missions to areas where there are growing needs for U.S. medical products and services: the Philippines and Indonesia; Kenya, South Africa, and Mozambique; and Egypt, Jordan, and Israel. Because of the increasing recognition of U.S. leadership in medical technologies in the region, Deputy Secretary Andrews also stressed the importance of the need to move forward on broad-based regional agreements like the Trans-Atlantic Trade and Investment Partnership and the Trans-Pacific Partnership that will expand exports, grow our economy, and create good jobs. More broadly, Deputy Secretary Andrews addressed the Administration’s commitment to helping American businesses take advantage of new export opportunities. He specifically outlined the five goals of the revamped NEI NEXT strategy: to help businesses find their NEXT customer abroad; to increase the efficiency of a company’s first and NEXT shipment; to help firms finance their NEXT order; to help communities integrate trade and investment into their NEXT growth plans; and to open up the NEXT big markets around the world while ensuring a level playing field. While in Minneapolis, Deputy Secretary Andrews also had the opportunity to meet with members of the U.S. Commercial Service and District Export Council, both of whom are valuable partners in Commerce’s efforts to support the U.S. export community. Last year, U.S. Secretary of Commerce Penny Pritzker unveiled the Commerce Department’s “Open for Business Agenda,” a bold policy agenda focused on boosting trade and investment, supporting innovation and entrepreneurship, and unleashing more government data. Yesterday, she took the Agenda on the road to California. Along with Minority Business Development Agency (MBDA) National Director Alejandra Castillo, Secretary Pritzker spoke to local businesses and community leaders about the Obama Administration’s work to spur continued economic growth and job creation through support of exporters, entrepreneurs, and small, women- and minority-owned businesses. Secretary Pritzker joined Congresswoman Barbara Lee (D-CA), a strong advocate for minority economic development and trade policy, at a regional economic development forum at the Oakland Airport, hosted by Lee. The Secretary delivered remarks highlighting a number of Commerce Department resources available to help foster economic growth. Noting that exporting is an essential tool for economic development, she discussed the Commerce Department’s NEI/NEXT initiative, a data-based, customer-driven effort to help U.S. companies increase their exports to international markets. Secretary Pritzker also talked about the work of the NIST Manufacturing Extension Partnership to help manufacturers boost productivity and growth, as well as investments by the Economic Development Administration (EDA) to help attract new industries and create jobs. Through these and other tools, the Commerce Department is helping businesses in California and across the country to grow and hire. Following the Secretary’s remarks, MBDA National Director Castillo led a panel discussion on economic development that helped to connect local business leaders and economic development organizations with the expertise of the Department and its resources. 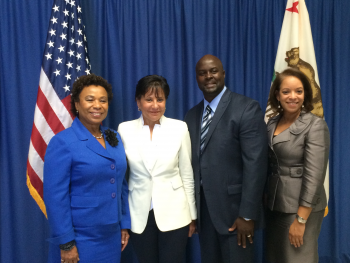 The forum featured OPIC’s Director of Corporate Development, Alison Germak; Port of Oakland’s Director of Aviation, Deborah Ale Flint; Alameda County Supervisor Keith Carson and Oakland Mayor Jean Quan. Exports are an important tool for economic development and job creation, which is why the Obama Administration has made increased exports a central pillar of its strategy for economic growth. 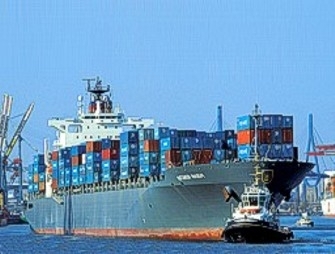 With the recent launch of NEI/NEXT, the next phase of the successful National Export Initiative, U.S. Secretary of Commerce Pritzker has made it a priority to expand the U.S. export base and to help more American businesses of all sizes – including rural businesses – capitalize on opportunities in foreign markets. 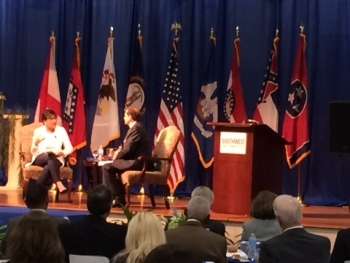 As part of this effort, Secretary Pritzker traveled to Memphis, Tennessee Thursday to participate in the “Made in Rural America” Regional Forum, focused on boosting rural exports. Hosted by the Delta Regional Authority (DRA), the forum convened small business owners, industry representatives, business support organizations, and local, state, and federal leaders to discuss ways to help rural businesses grow and reach the 95% of customers that live outside our borders. Secretary Pritzker participated in an armchair discussion with DRA Federal Co-Chairman Chris Masingill and discussed how we can all work together to enhance opportunities for businesses in rural communities and how we can focus on ways to increase exports from the Delta region’s many businesses. Today’s forum is the second of five regional forums to be held across the country, aimed at helping local businesses integrate exports into their economic growth strategies. At the Forum, Secretary Pritzker discussed the Commerce Department’s resources to help rural businesses compete in the global marketplace. The Commerce Department’s International Trade Administration (ITA) has trade specialists in more than 100 U.S. cities and over 70 countries worldwide to help companies take advantage of business opportunities abroad and connect them to trade events, foreign buyers, and other partners. In fact, about 85 percent of ITA’s clients are small and medium-sized businesses, and on average 38 percent are rural exporters. Since the launch of the NEI in 2010, 1.6 million more Americans are earning a paycheck from an export-supported job, bringing the total to 11.3 million jobs – the highest in 20 years. What’s NEXT for U.S. exports? Exports are critical to the U.S economy. They fuel economic growth in our communities, support good middle class jobs, and unlock opportunity for American companies, entrepreneurs, farmers, ranchers, and workers, enabling U.S. companies to compete in the growing global marketplace. By selling Made-in-America goods and services to international customers, U.S. businesses – including small and medium-sized and minority- and women-owned businesses – are able to grow faster, hire more employees, pay higher wages, and help spread American ideas, innovation and values. Recognizing the many opportunities exports create for our economy, U.S. Commerce Secretary Penny Pritzker today announced that the Obama Administration will build on the success of the National Export Initiative (NEI) by launching NEI/NEXT: a new customer service-driven strategy with improved information resources that will ensure American businesses are fully able to capitalize on expanded opportunities to sell their goods and services abroad. NEI/NEXT will help more American companies reach more overseas markets by improving data, providing information on specific export opportunities, working more closely with financing organizations and service providers, and partnering with states and communities to empower local export efforts. In 2010, President Obama launched the National Export Initiative (NEI), a comprehensive government-wide effort to help U.S. companies increase exports, expand into new markets, and compete globally. Under the NEI, the United States has had four straight record-breaking years of exports – hitting an all-time high of $2.3 trillion dollars last year – up $700 billion from 2009. A new economic report released today by the Department of Commerce, shows that nearly one-third of the country’s economic growth since mid-2009 has been driven by exports. Nearly 30,000 businesses have started exporting for the first time. And most importantly, since 2009, the number of jobs supported by exports has grown by 1.6 million to more than 11.3 million – the highest in 20 years. Even with all this success, far too many American companies remain focused on domestic markets. Less than 5 percent of U.S. companies export, and more than half of those exporters sell to only one market. To help bridge that gap, and look for new opportunities to help U.S. businesses export, the Department of Commerce, along with 20 federal agency partners last year began to take a fresh look at the NEI. This interagency group solicited extensive stakeholder feedback and incorporated lessons learned under the NEI, to develop an economic growth strategy that would help make trade a central part of America’s economic DNA. The end product of that interagency review, NEI/NEXT will take the NEI strategy to next level by institutionalizing our progress from the past four years and serving as a framework to guide the development of new, innovative initiatives. NEI/NEXT will be implemented through the Export Promotion Cabinet and Trade Promotion Coordinating Committee (TPCC), which consists of representatives from 20 federal departments and agencies with export-related programs. The Secretary of Commerce chairs the TPCC. Today, Secretary of Commerce Penny Pritzker announced NEI/NEXT – a data-based, customer service-driven initiative to ensure that more American businesses can fully capitalize on markets that are opening up around the world. Through five core objectives, NEI/NEXT will build on Administration-wide achievements under the National Export Initiative (NEI), to help all businesses reach the 95 percent of consumers who live outside the United States. If you missed her speech, below is a collection of tweets from her account and audience members that summarizes her remarks.